Within a ten day period, the Mental Health Association of Rhode Island said good-bye to two enormously respected members of its Board of Directors, both giants in the field of mental health. Dr. Joseph Bevilacqua was well-known in Rhode Island for his service to the state as Commissioner of the Department of Mental Health, Retardation, and Hospitals (MHRH). He also served as Commissioner of Mental Health in Virginia and Director of Mental Health in South Carolina. During his tenure in these roles, Dr. Bevilacqua earned a reputation as a fierce advocate for the rights of individuals who live with mental illness. Rhode Island became a model for other states in the design and implementation of deinstitutionalization, in large part because of Joe’s vision and leadership. In addition to his numerous other advocacy activities, Joe served as Director of State Initiatives at the Bazelon Center for Mental Health Law in Washington, DC, and as President of the National Association of State Mental Health Commissioners. The Mental Health Association of Rhode Island was honored to have Joe serve as a long-time member of its Board of Directors. He lent his expertise to MHARI based on his many years of experience. It is with gratitude and deep sadness that we say good-bye. In addition to his wife, Mary Ann, Joe is survived by daughter Christina; sons Michael, Dominic (Cristina Martín), and Anthony (Sue Mazzucco); grandchildren Justine (Emely), Mathew (Bianca), Carmine, Grace, and Nino, (and their mother, Therese Jungels), and Beatrice; brothers Mike (Yvonne), John, and Mark; and nieces and nephews. Dan McCarthy retired from a distinguished career as a top administrator in the Rhode Island Department of Mental Health, Retardation, and Hospitals (MHRH). During that time, Dan was instrumental in instituting several innovative programs for individuals who live with serious mental illness. In recent times, Dan’s extensive knowledge of community support programs was indispensable to the Board of Directors of the Mental Health Association of Rhode Island as we wrestle with cuts in the state’s mental health system. It was our good fortune to have Dan serve as an active member of our Board of Directors and its Advocacy & Policy Committee despite his multiple other interests and activities. Dan served as a Court Appointed Special Advocate for children in DCYF and spent time with those at the end of their lives as a Hospice volunteer. Dan was also active in his church community at Emmanuel Lutheran Church, and previously the Poverty Institute. Dan is survived by his daughter Kirstin Boehm, son-in-law Eric Boehm, partner Christine Stinson and her son Gabriel, his brother and sister-in-law Gerry and Jane McCarthy, nieces Mary Elizabeth, Eileen, and Kate, sister-in-law Susan Aronson, nieces Hilary, Vanessa, and nephew Tyler and sister-in-law June Aronson. His life’s greatest joy was being Grandpa (“Peepa”) to his 2-year-old grandson, Nash Boehm. Dan is pre-deceased by Claire Aronson, the love of his life and soulmate. Claire died of ALS in 1992 and Dan was her constant companion and caretaker. 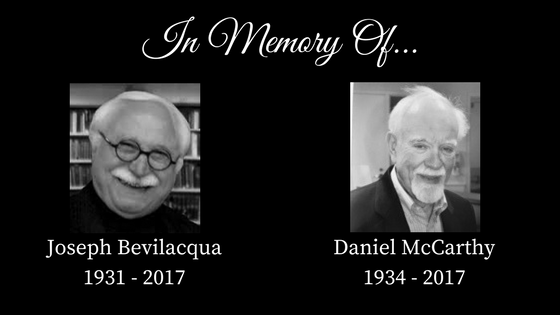 It is with profound sorrow that we honor the memory of Dan McCarthy–an advocate, a man of great integrity, a gentleman.